2draw.net - boards - Intermediate - brack mage. practice on clothing and character recreation. can't decide if he should be doing magic or not. some coloring.... have to do homework. meh meh meh, coloring with a mouse sux0rz. Nice work man, this is pretty nice. This reminds me of that little guy on the old HeMan cartoons. yea, I didn't do a heck of lot here... trying to figure out what I'll do for the background. Very nice. I like the colors and the shading is really good. I don't play any of those games but I've seen this character somewhere before. Hey, this is one of the best I've seen you do (besides that road home from Santa Fe thing that ought to be in the Showcase, and I still think someone should put the damn thing in there because it bugs me it's not there, and yes, I am telling the mods how to do their job, ahemmm) I must say you did an especially nice job on the perspective on the boots, particularly his right foot (at our left), that is alot more difficult to accomplish than it looks. Woaw! Damn! You do such an awesome job... *_* I LOVE how you did the energy in his hand... :D J will have to love this! Dude, Marcello... thanks!! When I said "draw a Black Mage" I didn't think I'd get this. 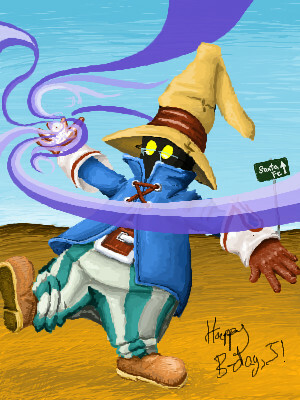 :) The Orko refrence is funny, because it's true; but in any case this Black Mage is better than Vivi could ever be! And thanks for putting in the glasses, that tops it off! I like the intricacy of his left glove, too. Heh. The whole thing is super-awesome. Thanks Marcello. Happy birthday to me!! OMFG!Thats so cute!Very nice coloring!